Do Cats Dream or Just Catnap? A lot of people wonder whether cats dream. That's easy to answer – of course they do. Cats are mammals, like us, and need sleep to rest their minds and bodies. It is believed that the body's natural state is in sleep. We stay awake only through constant neural activity within a brain region called the reticular activating system. When we, or our cats, are tired, we lie down, preferably in a quiet, dark room, close our eyes and sleep comes. The reason this happens is because we have shut down the 50 percent of afferent (inward) bombardment that comes from muscle tension, and have effectively curtailed auditory and visual stimulation. In other words, when you are fully relaxed, lying down, and are not listening or looking at anything, you fall asleep. We all know this, which is why we go to bed in the evening, turn off the radio, draw the curtains and turn off the light. We just don't know why we're doing it and neither does the cat understand his pre-sleep preparation measures. We both do what we have to because it works. The first phase of sleep cats and people go through is called light slow wave sleep (LSWS). During this phase the electroencephalogram (EEG) demonstrates slow undulating brain waves, but the cat is not fully relaxed and is easily roused. Next comes deep slow wave sleep (DSMS) in which the EEG slows further and the cat becomes progressively more limp and is harder to rouse. Finally, there is paradoxical or rapid eye movement (REM) sleep in which the EEG becomes extremely active once more, as if the cat is awake, and yet the body is profoundly relaxed. This latter sleep is sometimes referred to as the sleep of the body. Certainly the mind is getting no rest. It is at this most-difficult-to-wake stage of sleep that dreaming occurs. Humans awakened from REM sleep report that they have been dreaming. The fact that the body's muscles are relaxed does not mean that occasional movements cannot occur and it is quite common to see cats twitching or contracting their toes during REM sleep, as if they are experiencing some mental chase. 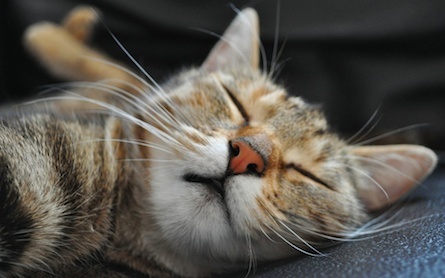 Cats sleep patterns are very much like our own. They spend about 10 hours a day asleep, mostly at night, and during this time cycle from SWS to REM and back. Just over 80 percent of their time asleep takes the form of SWS with the balance REM sleep. Although serotonin is known as the brain chemical involved in mood and is the one targeted by anti-depressants like Prozac®, its main function appears to be in organizing muscular activity. During LSWS, when the EEG is slowly undulating and the body is still in a somewhat tonic state, serotonin neurons are still active. Not just as active as when the cat is wide awake, but active nontheless. When REM sleep arrives, the EEG becomes active, muscle tone is absent, and serotonin neurons are silent. You might ask yourself how a cat can display rapid eye movement or limbs twitching during this stage of sleep. The answer is quite simple; serotonin neurons supply muscles that control large anti-gravity muscles and not those that control episodic behavior and fine movements, such as muscles that control eye position and movement of the digits. A catnap is what we see when a cat is in light wave sleep and serotonin neurons are active enough to maintain considerable muscle tone. The cat's mind is blank at this time and the EEG demonstrates an anesthetized pattern, yet he is able to maintain an eyes closed, limbs-tucked posture. This represents the "sleep of the mind" during which there is no dreaming. If we fall asleep in a chair, people say we are catnapping, and the term is most appropriate. That's exactly what we are doing. Although they sleep mainly at night, cats are crepuscular rather than truly diurnal like us. Crespuscular refers to their tendency to be most active at dawn and dusk, when their prey would normally be most active, with periods of snoozing and sleeping in between times of peak activity. And, if we or our cats become totally relaxed, with our eyes darting back and forth, we're likely dreaming. The subject matter of dreams, however, probably reflects species specific preoccupations, with us more focused on our hobbies and interests and them dreaming of an easy-to-catch mouse.